Many people nowadays are installing aftermarket HID and/or LED conversion kits in their headlights and fog lights. These new conversion kits use an external power booster, called a Ballast for HID setups and a Driver for LED setups. Both of these external power supplies do similar functions, but technically they are quite different. Also, both of these products create RFI (Radio Frequency Interference); in fact every electronic device ever made creates RFI, but there are different types of this electrical interference. Sometimes when installing an LED conversion kit or an HID conversion kit in your vehicle the result can be better, brighter light, but also a side effect of AM or FM radio interference. This is characterized by where you once were able to pick up a radio station, with the new lights installed and turned on, now that same radio station is just white noise. 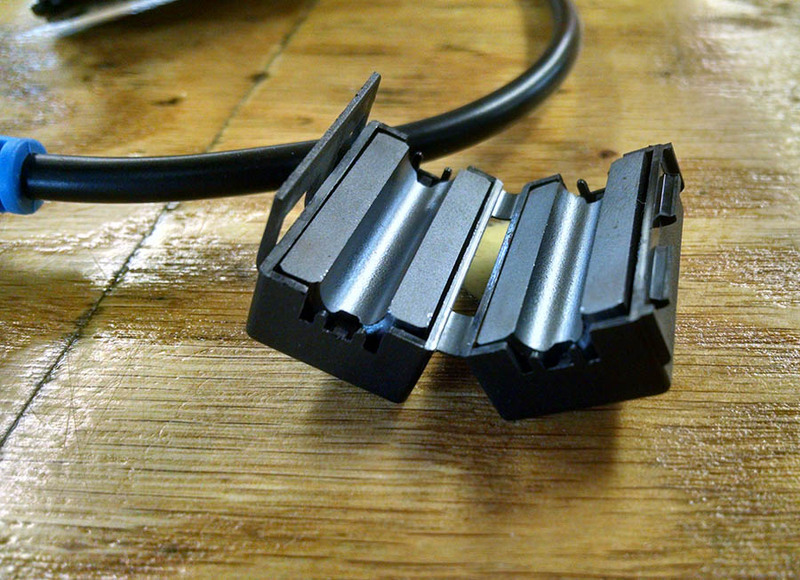 Here is an example of a DIY ferrite coil that can be used in lighting installs. The solution for your problem might be what is called a ferrite coil, also known as a ferrite bead, a ferrite choke, or an RFI choke. All of these names mean the same thing. Ferrite beads prevent interference in two directions: from a device or to a device. A conductive cable such as the input power for the HID or LED headlight bulbs acts as an antenna – if the device produces radio frequency energy, this can be transmitted through the cable, which acts as an unintentional radiator. In this case the bead may be required to reduce RFI. Conversely, if there are other sources of RFI, such as an ignition module or battery charging alternator, the bead prevents the cable from acting as an antenna and receiving interference from these other devices. Ferrite coils are commonly used in household electronics to reduce interference signals. The recommended size for the smaller version to snap over the power cable measures approximately 1.25 x .75 x 75 inches and is designed for RG8 or LMR400 Cables. It’s the perfect size for fitting on the power input. Another option for an LED conversion kit ferrite coil is a larger version designed for the power wires to wrap around. The inside hole size is 0.57″ (over 1/2″, 14.5 mm) which is a loose fit for RG-8 type coaxial cable. This is a better method because the power wires go through the ferrite hole twice due to the loop around. You want to install the ferrite coil around the part of the system that has the power input to the ballast. 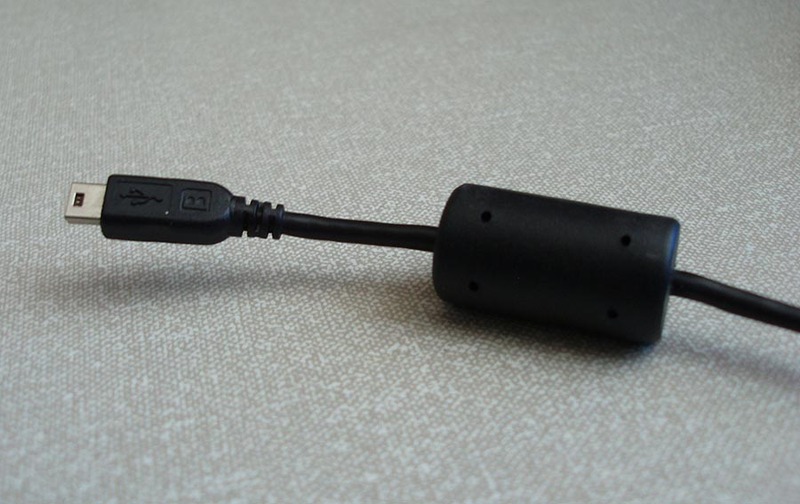 Another option for an HID conversion kit ferrite coil is a larger version designed for the power wires to wrap around. The inside hole size is 0.57″ (over 1/2″, 14.5 mm) which is a loose fit for RG-8 type coaxial cable. This is a better method because the power wires go through the ferrite hole twice due to the loop around. You want to find a section of the power input harness with the 2 smaller wires exposed so they can better wrap around and through the ferrite coil to form a loop. where can I buy Ferrite Coils? They should know what you need. I have installed a lot of ferrite chokes on my system and they do not work. Although I can stand outside of my jeep, place my left hand on the seat and put my right hand over the face of the radio and the interference goes away. Very frustrating…..
Hi Greg, that means you have radiating interference, not inline interference. In order to solve radiating interference you either need to use a different product that doesn’t have this issue, or physically isolate the product from the rest of the vehicle by creating a ground field. One example is to wrap the HID ballast or LED bulb driver (whatever you’re using) with tin foil or wire mesh “fabric”. If this makes the problem lessen or go away, then you’ve confirmed the type of EMI you’re dealing with and you can come up with some other more permanent fixes. Ferrite coils only work on situations where the interference is inline, or called line EMI. I installed new LED Fog lights and strangely my radio was not working very well. This post was excellent in identifying the issue and providing a remedy for it. Thank you very much. I have since installed many ferrite chokes on the wires behind my led headlights. they still interfere with my radio reception. what next? James, if the ferrite chokes do not work then your interference is not “radiant” interference, not in-line interference. This means that you would need to shield the entire device as good as possible away from the vehicle electrical system, not just filter out the line. There are several methods for this, most include wrapping something around the product like tin foil, or building some sort of a wire mesh cage. Sounds silly, but basically you want to create a small scale version of a Faraday Cage. If you aren’t familiar with the term, just google it. There is a ton of info out there about it for other applications. Ferrite cores, dont work and my led work ligth is full aluminium cage, and also i put a aluminium foil, but nothing. Hi Rodrigo, I think it all depends on the brand you’re using. We’ve never run into a problem that cannot be solved with GTR Lighting LED headlight bulbs… perhaps the ones you’re using are not possible to fix? I’m having an issue with radio interference also. I’ve recently installed led rock lights or undercarriage lights. I have 8 light pods mounted under an aluminum frame gasoline powered golf cart. My radio reception is fair until I turn on the rock lights which have a toggle switch and their own fused power line from the battery, then just static. I’ve done several things to try to isolate the problem. I disconnected the radio from the cart battery and powered it from another source. Same thing happens when I turn on rock lights – static. I disconnected rear speaker wires from the radio ( they are run in same wire casing as the rock lights). Same thing happens when I turn on rock lights – static. I disconnected the led driver from the wiring harness that goes to every rock light. This time when I turn on rock lights, there is no decrease in radio reception. Next I disconnected every rock light at the light itself and reconnected the driver to the wiring harness. When I turn on the rock lights, there is no decrease in radio reception. Next I tested every rock light individually. Whenever I connect any of the lights, I get the decreased reception. So the interference appears to be coming for the led lights themselves. I am confused because I thought the interference would come from the driver. Any thoughts on this would be greatly appreciated. Hi , I have just upgrade to JW Speaker LED head lights on my Toyota Hiace 2014 , Im now getting static and in some cases losing reception on my radio. Should I put the ferrites on just the power wires or can one be put over the whole input loom wires? Ground your car with daisy chain grounding under the hood. Don’t believe the people that are pushing these Fer-rite cores they don’t seem to work in a car. All cars that are mass produced have weak grounding, the wires are thin and corrode over time. Do not follow these misguided recommendations until you reground your car with heavy ground wires from battery to engine to alternator case to car body, Clean all areas where there is paint. If you have a high end stereo system, use heavy wire from alternator output to battery plus side for increase current. Thanks for this tip! If you’ve had luck with this method in the past then it is just as applicable as the ferrite coils! Thanks for sharing. Hi. I installed led headlights on my car and since after driving for about 20-25 minutes with lights on the TPMS warning light turn on. If I put back regular halogen bulbs, I don’t have this problem. Do you think ferrite cores could solve this problem ? Hi Martin, it’s possible… What you’re experiencing is a sort of radio interference caused by the new LED bulbs. It’s actually kind of common and has more to do with the technology your car uses for the TPMS system than it does the LED bulbs. If your TPMS system isn’t shielded very well you’ll run into this sort of thing. Adding the ferrite coils is definitely the easiest and cheapest way to go! Definitely start there.